Every company publishes a report each year known as annual reports of the company. It contains details about the business and sectors as a whole as well as other future projecting information regarding the business, sector, and environment as a whole. Some information in annual reports is very important for any investor considering to invest in the company especially in the small-cap companies. As an investor, I don’t jump to the annual reports directly. I first start with my investment checklist followed by business checklist and fundamental analysis and try to reject companies to consider investing. Once I am satisfied with the basic checks and about the business, I dig deep into the annual reports of the company before taking the final call for investment. Where to look for Annual reports? Annual reports are available in PDF format for any listed company at the BSEIndia website. Search the company at BSEIndia.com and look for the annual report’s column in the left sidebar. It will show annual reports of a company for the past few years. Apart from the BSE website, they are also available on the website of the company under the Investor section. Though it can vary depending on the design and layout of the website the section is generally termed as “Investors” or anything related to it. Though annual reports are averagely over 150 pages of PDF document, and one can skip most of the sections, still it will take almost an hour or so to go through all the important details one needs to know before investing in the company. So be prepared to go through the details, it will take up some amount of your time for sure but it is worth every penny. It can help you unearth some of the details that may not be directly visible in the financial data of the company. So let us see what are some of the key items one should look for in the annual reports. 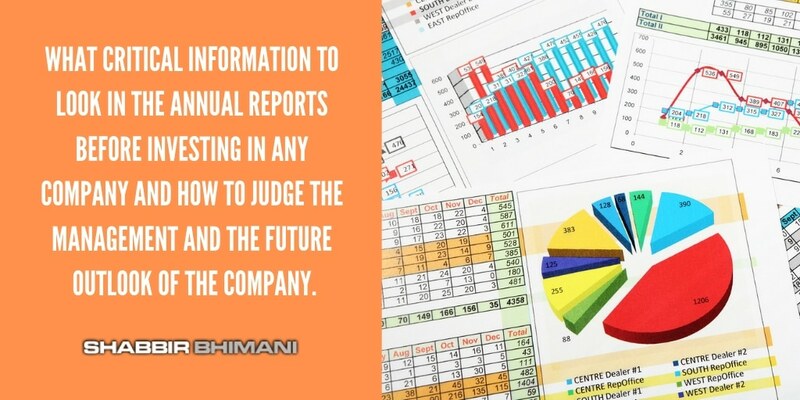 Annual reports contain information about the owner / co-owner of the companies as well as the name of the directors, the board of directors, the CEO and the CFO and other key personnel in the company. It is important to know the person where you want to be investing your money. If you have a doubt as to why this information is important, think from the perspective of investing in any other business. If someone offers you a good investment opportunity but doesn’t tell you who will be doing the business or how it will profit, will you consider investing? So if you know the people who are doing the business, it can help you know them more. Google their names to see if they are on social media especially on twitter and try to follow them. See what kind of updates they share on social media. Subsidiary companies are the companies owned by the parent company in which we want to invest in. The company having too many businesses under many subsidiaries is something I tend to avoid because such companies can easily lose the track of the main business or even if they don’t lose track, the focus to excel in the main business can be diluted. So here is the list of subsidiary companies of Pidilite Industries from it’s 2018 annual reports. As we can see a lot of companies are subsidiary companies. As the company grows big, different companies in a different country become subsidiary of the company or if a company acquires other company, they become the subsidiary of the parent company. It is also important to take a note of the ownership of the parent company in the subsidiary company. How much are the companies owned in the subsidiary company? What is the shareholding pattern in the subsidiary company? Who others are the investor in the subsidiary company. The other important aspect of the annual reports is the chairman’s report or management’s report. Often this statement is about how the business has done and how is the future. What a company is doing and what are their targets for the future. Here I like to see things in a lot more details. I download 4 to 5 year-old annual report of the company and see how they had predicted and how did they achieve it. If the company has a target for the future, I like to see how well they managed to achieve their target in the past. As an example, Amara Raja batteries has a revenue of 6kCrores and they set the target to reach a revenue 60kCrores in 10 years. Such forward-looking statements are good but it is also important to know how efficient is the management to achieve the same and how well they managed to achieve it in the past. To get the view of a sector, it is important to skim through the annual reports of the few companies in the same sector instead of relying only on one company. I often prefer to invest in a company that has a very unique product offering but to get the sectorial view about the growth and prospects in a company, one can look at other companies offering similar products and see how things may pan out for the sector as a whole. So for Amara Raja batteries, to get the sectoral view of the company is good but then using Exide Industries annual reports can also help. 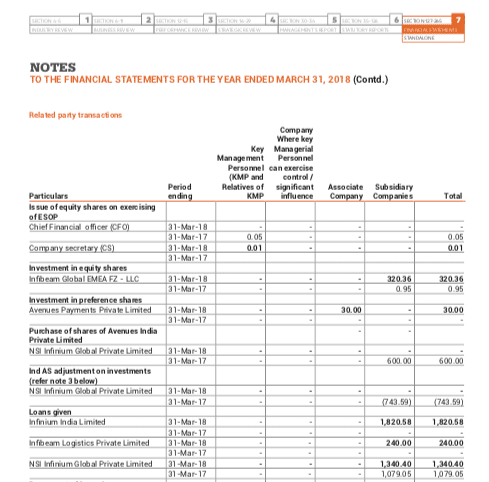 Similarly, if you want to focus on investing in Asian Paints and want to consider their annual reports, one can also use Berger Paints annual reports for getting the better idea about the sectorial view. If a company is painting a very rosy picture of the sector and others aren’t that is when things can go wrong. It can mean things are really good for one company but not so good for other but it can also mean the impact is yet to be seen by the company. As an example when I started switching my investments to the pharma sector in late 2017, one of the reason was, Lupin predicted very good future outlook beyond 2020 for the sector. So I used other Pharma companies annual reports to confirm the same. One of the important factor to consider an investment in the company is how is the management/board and other key people in the company are being paid. If they are paid very high as compared to the profits, it is a red flag for me to consider an investment. The management shouldn’t be drawing too much salary and it should be in line with the profit a company makes. How the company has transactions with its subsidiary and other related parties. 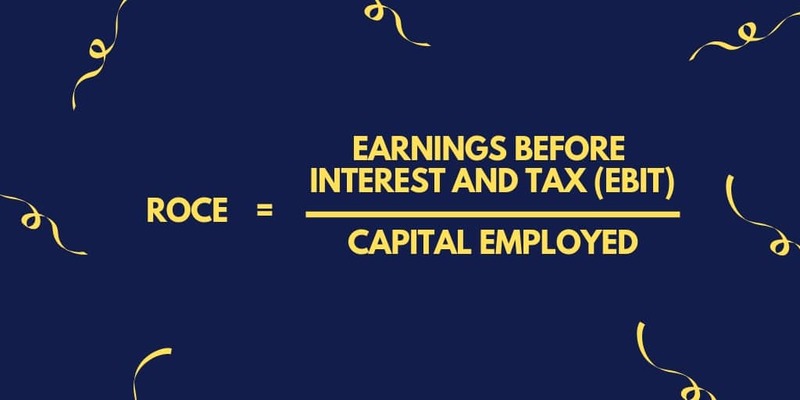 This is very important information because it helps to understand how the profit in the parent company is being used by its subsidiary company. As an example, recently Infibeam was in the news recently for a largely related party transaction. Management also clarified it as normal for an eCommerce company. We see the same as quite often the case in the annual reports as well. But when I see too much money flowing between subsidiary companies, I don’t prefer investing in it. So how the company is planning to fund future growth? What plans do they have for future growth? Every company will share forward-looking statements but how they are planning to fund those plans to continue on the growth trajectory. Are they setting up a new manufacturing unit and how they are funding future growth plans? Will they be taking up debt to fund the growth. Will they fund it from the companies profits? Will management infuse the money? 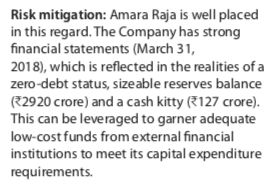 As an example, here is the statement from Amara Raja’s 2018 annual report about capex plans for the future. Which should be comforting for the investor. How is the capacity utilization of the company is and what are their plans to ramp up the capacity for future demand? A manufacturing company will have a capacity to manufacture a product but what is the actual amount being manufactured will decide how much of the capacity is being utilized. So if a company can manufacture 100 units and are manufacturing 75 units, the capacity utilization is 75%. It helps in understanding the right stage of the business. If the capacity utilization is very high, it can mean a company will need to work on expansion plans. If the capacity utilization is low, the management may have the chance of increasing their utilization but it is also important to look at why the utilization is low. It can mean they added the new capacity and so the utilization is low currently. Check the past annual reports and see if they had high capacity utilization or not? It can mean they are in some cyclical business and demand is low at the moment. See past annual reports when the cyclical nature of the business was at the peak and what kind of capacity utilization company managed to achieve. Here one has to consider all aspect of the business to understand the utilization. There is no general rule like utilization should be above 80% or there is no general rule that 40% of utilization is bad. If the utilization is 80%, the company may need to be going for capex, the share prices may correct because profits may not go up. Similarly, if the utilization is low, capex may not be needed and whatever increase in topline may trickle down to the bottom line directly which means the share price can go higher. So lower capacity utilization may mean the management is not efficient but if you can get the idea about the management from other parameters, it may be an ideal time for investing in the company. So read the capacity utilization with a pinch of salt. It can work out either way. The other important section of the annual reports is the risk outlook for the company. It is one section I always read in the annual reports. Management should be aware of the potential risk to the business. Once the management knows about the risk, it helps build my confidence to remain invested in the company. 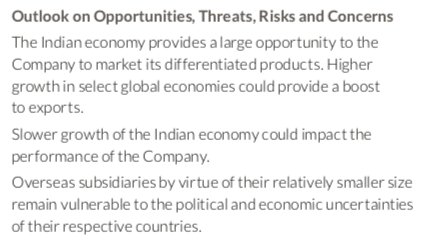 Here are some of the key risks as mentioned in the annual reports of Pidilite Industries 2018. I expected the higher crude price which is one of the key raw material for the company will be a risk but the management is confident the increase in raw material prices will be passed on to the customers and so it isn’t part of the risk to the business. So higher crude isn’t a risk to the business and this gives me the confidence to remain invested. The most important part of the annual reports is the consolidated financial results. Often people consider the standalone results but it is wrong to only view the standalone results. Always refer to the consolidated financial results because the company you want to invest in isn’t a standalone entity but it is the consolidated entity of all its subsidiary. The best example can be Tata motors. If you look at only standalone results, it may mean you are only looking at India operations of the company but the consolidated results mean you are looking at the overall Tata Motors including the Jaguar and Land Rover operations of the company of the Indian Tata Motors. There is critical information that can help you as an investor to invest in business using the annual reports. I will share one of my examples. I invested in Divi’s Lab when I found that stock has corrected almost 60% from its peak but the total business of the company in the US was 30%. As I did the analysis from the annual reports, the total business of the company was getting lower and lower in the percentage terms from the US. It wasn’t that company isn’t increasing its US sales but the sales around the globe were at much better growth than the business in the US. So all the US FDA issues even if they remained and were not sorted at all, it was still was a good investment considering the stock was down 60% from its peak. Such kind of critical information can only be found from the annual reports. Annual reports can be long and boring but then if you can invest little time to read the important details, it can help you invest with confidence. What other information one must refer in the annual reports. Share your views in the comments below. You are here: Home / Investing / How to Read Critical Information in the Annual Reports Faster?